Doubling of tourist arrivals to five million in three years requires Sri Lanka to take some bold and innovative measures apart from effective marketing of a more organised tourism destination, a top expert opined. 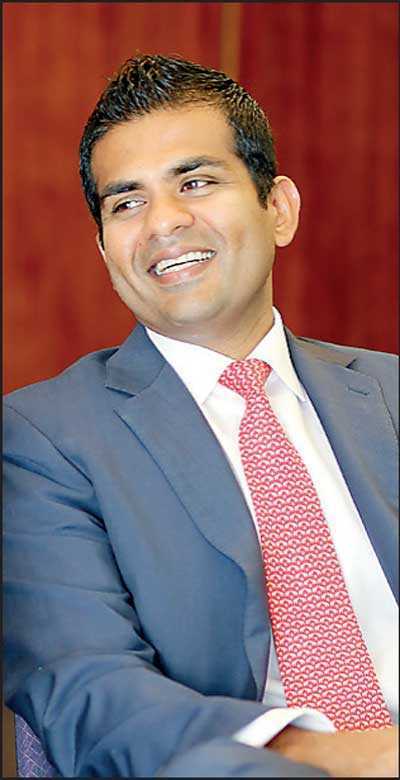 Steradian Capital Joint Managing Director and Lanka Realty Investments Plc Managing Director Hardy Jamaldeen Hardy Jamaldeen, who is also a Director at Hayleys Plc, which has interests in travel and tourism, says Sri Lanka can learn fast from the more tourism successful countries such as Thailand, Malaysia and Singapore and others to get the effort and strategy right. Hardy, who has analysed three other countries which are successful in attracting tourists — Thailand, Malaysia and Singapore — says Sri Lanka meets only one of the seven criteria for success. 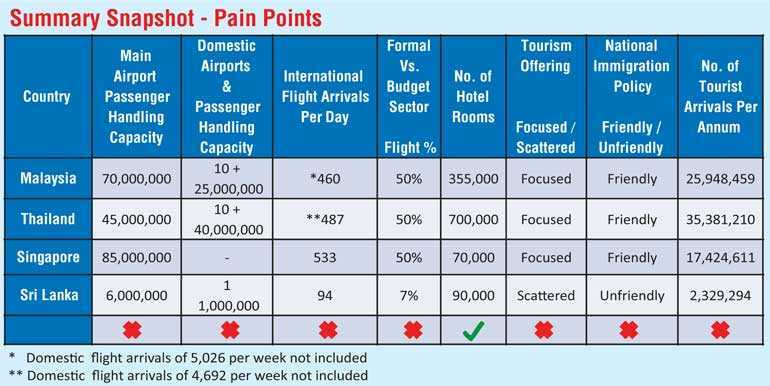 He says Sri Lanka’s main pain points are lack of capacity at the Bandaranaike International Airport, underdeveloped domestic airports, fewer number of international flights, low percentage of budget carriers, unfriendly immigration policy and disjoined destination offering. The only satisfactory capacity is the number of rooms, though the industry is divided over quality, service offering and pricing. Immediate expansion and modernisation of the Bandaranaike International Airport is a key priority, he said. Currently the BIA’s capacity utlisation is an unprecedented 163%, suggesting resources have been overstretched, forcing an unpleasant experience for the international traveller. BIA’s designed capacity is six million passengers but it is handling nearly 10 million per annum. Of the traffic handled, over 20% comprises tourists. “If the capacity is increased to 20 million maintaining the 22% arrival mix, it means 4.4 million tourists,” he said. However, to reach the desired five million tourist figure, the arrival mix must be increased to 25% from the current 22%, he explains. Hardy also emphasised on the need to increase the number of daily flights from the current 94 to 200 and the ratio of full-service and budget carriers must be substantially increased from 7% at present to 50%, which is also similar to the more successful destinations such as Thailand, Malaysia and Singapore. Apart from proper development and marketing of the destination, Sri Lanka must truly adopt an open skies policy with special agreements with SAARC countries and perhaps ASEAN. In terms of creation of a friendly Immigration Policy, Hardy says visa on arrival for tourists from regional destinations is a must. “Charge the visa fee into the ticket, similar to the previous Embarkation Tax,” he added. He also opines that in comparison to Thailand, Malaysia and Singapore, Sri Lanka’s tourism offering is scattered. “We need to focus on wellness tourism, Ayurveda tourism, bird-based tourism, festival tourism, etc. to make Sri Lanka more attractive to tourists if we are serious about achieving the desired five million target,” Hardy emphasised. Following is the full analysis and recommendations by Hardy. 22% of the 9.8 m passengers handled at the BIA are tourists visiting Sri Lanka. If the capacity is increased to 20 m as planned, maintaining a 22% arrival mix will result in 4.4 m tourist arrivals. In order for tourist arrivals to reach five m with the enhanced capacity of 20 m, the arrival mix will have increase to 25% from the current 22%. The Mattala Airport has a current capacity of one m passengers, however, commercial operations have now ceased. A second stage of expansion was planned for the Mattala Airport to increase the capacity from the existing one m passengers (approximately) handling capacity per annum to five m passengers. The expansion plans were subsequently halted. Positioning Mattala as an operational international airport in Sri Lanka will greatly enhance the overall international passenger handling capacity. The geographical location of Mattala will in addition improve overall connectivity to the deeper southern coast of the island and significantly minimise travel time for the tourists. The proper functioning of this airport will further enhance the accessibility of the Eastern Coast of Sri Lanka. 42% of all flights that come into Sri Lanka are from Singapore, Malaysia, Thailand and India (SMIT). 16% or six of these flights coming in from Singapore, Malaysia , India and Thailand are budget carriers. Assuming that 90% of passengers coming in from the additional 27 flights per day are tourists, this will equate to an additional 1.4 m tourists per annum from SMIT. 5% of all flights that come into Sri Lanka are from China. 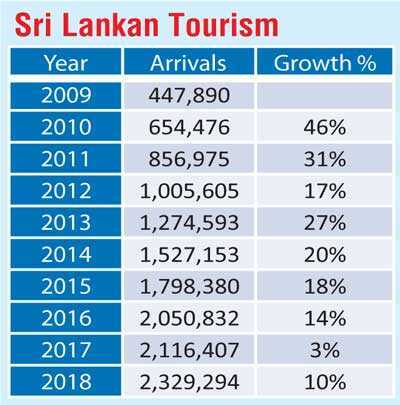 Chinese tourists into Sri Lanka account for 11% of the total tourists that visited Sri Lanka in 2018. Globally, Chinese tourists were the highest spenders by spending $ 258 billion in 2017 (increase of 5% compared with 2016). China has been the top spender in international tourism since 2012. The five flights bring in approximately 310,000 passengers a year. A doubling of the flights to 10 would bring in 620,000 passengers a year of which 50%+ could be potential tourists. Sri Lankan tourist arrivals have consistently grown at double-digit level post-war. The Bandaranaike International Airport (BIA) is currently over-utilised. An expansion was underway and this was expected to increase the passenger handling capacity from the existing six m p.a. to 15 m p.a. Of the total passengers passing through the BIA, 22% enter Sri Lanka as tourists. The low statistic indicates that the majority of the passengers use the BIA as a transit platform to other regions. The budget flights that arrive in Sri Lanka from the above destinations are Air Asia , IndiGo and Spice Jet. Budget carriers greatly support the tourist arrivals into the above mentioned countries since they account on average for 50% of the arrivals into their respective countries. The lack of budget carriers coming into Sri Lanka from regionally important destinations and the resultant negative impact on the overall tourist numbers is clearly evident. BIA and Mattala are the only two international airports in Sri Lanka. These two airports are geographically located to serve the western coast and the deep south. However, given that the airport expressway is still not connected to the southern express way, reaching sites in the southern coast would still take over one-and-a-half hours. In order to enhance connectivity, it is imperative that existing regional airports in areas such as Ratmalana, Palali, Trincomalee, Batticaloa and Koggala be upgraded to serve the international passengers. An expansion was underway at the BIA to increase the passenger handling capacity. The BIA requires a domestic terminal as well to facilitate internal flights to other regions in Sri Lanka. Plans are being drawn up to upgrade the Palali airport as well. Sri Lankan tourist arrivals have consistently grown at double digit level post war. The budget flights that arrive in Sri Lanka from the above destinations are Air Asia, IndiGo and Spice Jet. Singapore tourist arrivals have maintained a growth rate of between 6-8% over the last five years. Despite the Changi Airport’s capacity utilisation being recorded at 73%, in anticipation of the growth in passenger arrivals, Changi Airport’s fifth terminal, Terminal 5 (T5) is being developed. T5 is expected to add further capacity of 50 million passengers p.a., bringing the total to 135 million compared with the current 85 million. Of the total passengers passing through the Changi, 22% enter Singapore as tourists. This figure is the same as Sri Lanka. This is yet again indicative of the importance of Singapore as a transit platform to other regions. Thailand tourist arrivals has maintained a continuously declining single digit growth rate of between 6-9% over the last three years. The main airport, Suvarnabhumi is currently over-utilised and an expansion plan is underway to almost triple its passenger handling volume from the current 45 m p.a to 125 m p.a. The expansion will include the construction of one additional runway and the subsequent enlargement of domestic and international terminals. Of the total passengers passing through the Suvarnabhumi Airport, 58% enter Thailand as tourists. 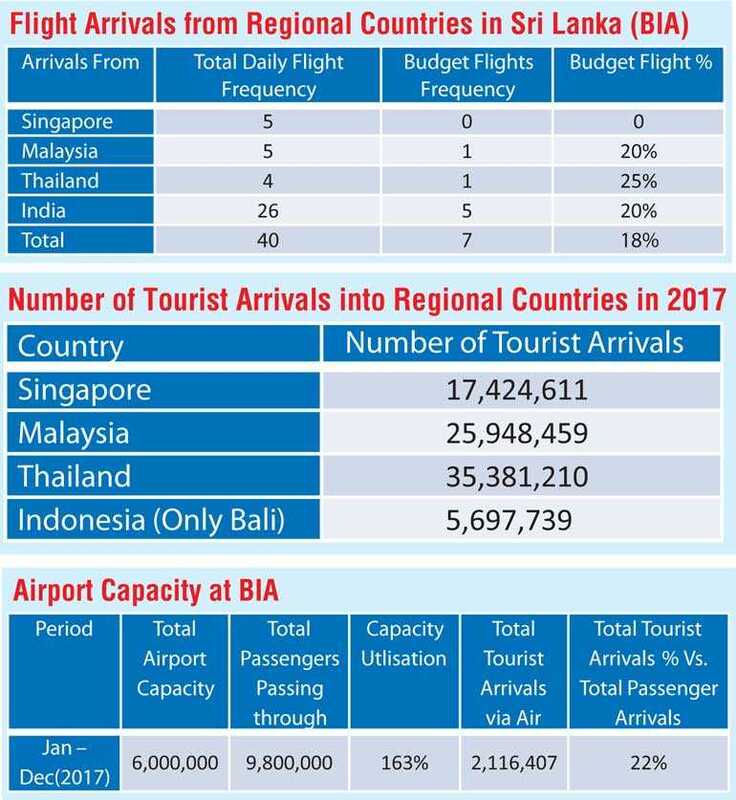 This figure is indicative of the importance of having adequate airport infrastructure to support Thailand’s tourism drive given the current over-utilisation of the airport. It should be noted that Thailand has several regional airports that serve international passengers/tourists who visit the several scenic islands of the coast of Thailand. Malaysian tourist arrivals have demonstrated a combination of both positive and negative growth during the last five years. 2017 denoted a decline in arrivals by 3% compared with 2016. The main airport, Kuala Lumpur International Airport (KLIA), has a capacity utilisation of 84% as at present. Given the foreseen growth in passenger arrivals, an expansion plan is underway to increase the passenger handling volume from the current 70 m p.a to 100 m p.a. via a three phase development plan. Of the total passengers passing through the KLIA, 44% enter Malaysia as tourists. This figure is indicative of the balanced mix of travellers who use KLIA as both a transit platform and as the destination port. Similar to Thailand, Malaysia too has several regional airports that serve international passengers/tourists who visit the islands off the coast of Malaysia and the other regions in the country. 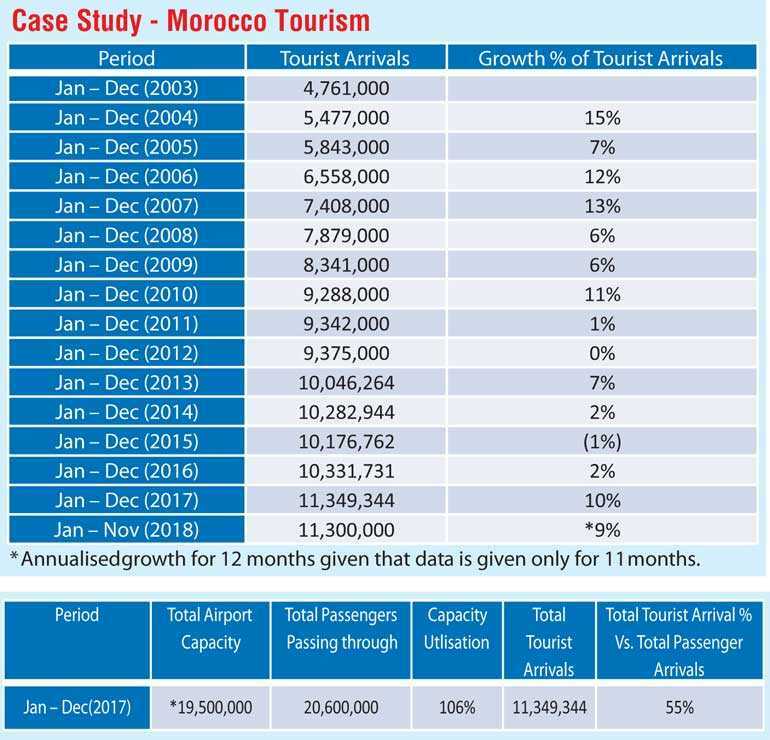 Morocco's tourism sector has exhibited strong growth since the government of the new King Mohammed VI reiterated its status as a strategic sector for the economy in the early 2000s. Soon after King Mohammed VI acceded to the throne, in 1999, he took the initiative to create, in close cooperation with the private sector, a new strategy on tourism called ‘Vision 2010’. This vision was formally signed in 2001 and had two primary goals: 1) to serve as a roadmap for the tourism sector until 2010, and 2) to allow the Moroccan tourism cluster to compete effectively with other tourism clusters in the Mediterranean region. The signing of an ‘open-skies’ agreement with the EU in December 2005 helped make Morocco one of the fastest-growing countries for air travel. The king of Morocco invited all European budget airlines to fly to Morocco, changing the policy from defending its National Carrier, Royal Air Maroc. The removal of all capacity restrictions between the EU and Morocco resulted in attracting new market entrants. As a result of this agreement Royal Air Maroc faced intense competition from Low-Cost Carriers (LCC) eager to exploit profitable routes between Western Europe and Morocco. In order to counter the competition from LCCs, Royal Air Maroc extensively renewed its existing fleet and put in place aggressive cost-cutting mechanisms to enhance its efficiency and position in its segment. Tourist arrivals to Morocco have demonstrated robust growth, averaging between 7-10% during the previous five years. The four main airports are currently over-utilised with a capacity utilisation of 106% as at present. An expansion plan is underway at Casablanca Mohammed V International Airport to increase the passenger handling volume from the current seven m p.a. to 14 m p.a. This expansion will boost the combined capacity of the four main airports by 36% to 26.5 m compared with the current 19.5 m.
Of the total passengers passing through the four main airports, 55% enter Morocco as tourists. The airport is of importance since it serves as a gateway to both Europe and Africa. Morocco has six international airports and more than a dozen smaller airports that serve the main city and other regions in the country. The eight countries in the SAARC could form a similar pact that will allow for more liberal air traffic rights including monetary benefits, which may include reduced or nil runway charges, passenger chargers, parking charges, aviation security fees, ground handling fees, landing fees etc. This could translate to a lower ticket price thus improving the overall proposition to visit Sri Lanka. Possibilities of the SAARC Aviation Pact expanding to also include the Asean countries could be considered. The adoption of Open Skies by Indonesia was expected to boost intra-Asean tourism, benefiting primarily low cost carriers operating in the region and hospitality firms. Indonesia’s ratification of the 2009 Asean Open Skies agreement brought the region closer to the formation of a single aviation market. Forming of partnerships with the regional countries to facilitate (link) a Sri Lankan leg (stop-over) in the tourism journey for foreign tourists. A policy of visa on arrival from regional destinations needs to be implemented to emphasise ease of travel. Charging of the visa fee into the ticket, similar to the previous embarkation tax. Additional and manned immigration counters should be in place to ensure quicker processing of tourists coming into Sri Lanka. A more people-friendly, welcoming demeanour should be practiced by all staff at the airport with special emphasis on the immigration officers. A fast track at the immigration counters for Business and First Class passengers. Deployment of tourist guest relation officers at key points in the airport to assist both arriving and departing tourists. There are around 6,500 registered Ayurveda practitioners in Sri Lanka, with around twice that number practicing informally in the villages. There are specialised Ayurveda resorts catering almost exclusively to visitors to Sri Lanka. The GoSL (Government of Sri Lanka) should actively encourage the setting up of high-end Ayurveda resorts and wellness resorts to capture the growing global wellness tourism market. Tax concessions, long-leases, import tax concessions on equipment etc. are some of the tools that could be used to promote investments in this sector. An active promotion campaign on international wellness websites, in-flight magazines, BIA airport hoardings, participation in global wellness conferences could be used to build awareness for this service offering. Setting-up of a chain of wellness resorts across the island will ensure that certain tourists may ‘wellness hop,’ which will result in exposure to different parts of the island and create economic growth in areas that were previously not contributing as much to the economy. Sri Lanka is home to 26 endemic bird species and seven proposed endemic species. The total number of bird species recorded in the island is 492, of which 219 are breeding residents. BirdLife International recognise Sri Lanka as one of the world's Endemic Bird Areas (EBAs). Bird-based tourism is growing rapidly, including in developing countries. Bird watching is reported as being the fastest growing outdoor activity in America. An increasing number of birdwatchers are traveling to long haul destinations to spot new birds that cannot be seen in their own country or region. The Caribbean Tourism Organi-sation estimates that three million international trips (worldwide) are taken each year for the main purpose of bird watching, and many more trips combine birding with other activities. In the USA, birdwatchers are estimated to spend over $ 2.5 billion each year. In the UK, expenditure is estimated at $500 million each year. Surveys find that bird watchers are usually highly-educated, affluent, slightly more women (56%) than men, and made up of all age groups, but middle-aged and elderly people represent the largest group (40-70 years of age). Apart from the bird sanctuaries as provided above, given below are a few of the main bird-watching sites in Sri Lanka. 1) Jurong Bird Park: The park is one of the Asia's largest bird havens with over 5,000 birds from 400 different species. 2) Kuala Lumpur Bird Park - This park provides shelter to more than 3,000 birds and 200 species in an enclosed aviary. It is a famous tourist destination in Malaysia, receiving around 200,000 visitors annually. Develop and expand bird-based tourism, proactively target birdwatchers, nature travellers/eco-tourists and nature photographers from Europe and Asia. Offer what birdwatchers require, including safety and security, accessibility to habitats, good infrastructure and knowledgeable guides. Advertise and promote the country’s or area’s birdlife and top birding sites. Feature charismatic, emblematic bird species in advertising. Highlight country’s best amenities for birders (lodges, national parks, birding towers, trails, etc.). Advertise in diverse media, to include not only in websites, but also festival publications, social media, guidebooks, and printed materials in appropriate languages. Attend international events, such as the British Bird Fair, to market the country’s bird tourism offerings. Target higher value overnight tourists rather than day, stopover or cruise tourists who put little into the local economy and may have little or no environmental understanding or conscience about their impact on a country’s natural resources. Increase environmental awareness through education of school children and the public to build a local constituency to support parks and protected areas as well as bird watching and other types of wildlife tourism. This initiative could culminate into the creation of eco-tourism hubs and also aid in forest conservation . Heightened international promotion and awareness creation on season based tourist activities – Kandy Perahera, climbing Adam's Peak, Kataragama Devala Perahara, Vesak and Poson festival, visits to Sigiriya Rock Fortress, Nallur Festival in Jaffna (the island's longest festival, spanning 25 days of vibrant chariot processions, drumming, dancing and acts of self-mortification, held in honour of the war god Skanda). At present, the Kandy Perehara is the only attraction that has been adequately developed to facilitate the viewing by international tourists. The town of Kandy has put in place suitable infrastructure by way of viewing locations, accommodation, eateries etc. in anticipation of the arriving tourists. During the season of the Kandy Perehara, all tourist accommodation operate at 100% capacity. Significant infrastructure development is required in order to uplift the elements of the other attractions to international standards. The Sigiriya Rock Fortress is a UNESCO heritage site and the educational aspect should be given emphasis in order to add value to a potential tourist. Open air, amphitheatre style environments (non-permanent structures) that seamlessly blend with the surroundings could be created in the region to educate the tourists of the rich cultural heritage. The same style could be employed for other historically significant tourist attractions as well. The Vesak festival is celebrated on a grand scale in Colombo whereas the Poson festival plays an important role in the villages in Sri Lanka. Many tourists flock to Colombo during the Vesak season to observer the pandals and lanterns that adorn the streets. The Deepavali festival is also known as the festival of lights. The Beira Lake in Colombo and its immediate periphery could be developed similar to Clark Quay in Singapore to create a tourism hotspot given the high concentration of hotels in the nearby vicinity. Implementation of a seamless taxi service that facilitates tourist specific travel with superior connectivity between the BIA, tourism hot spots and other domestic airports. Enhancing the railway network by replacing old carriages and enhancing certain carriages to appeal to the high-end traveller. Implementing a regulated trishaw service that could enhance the overall travel experience for tourists. English training for trishaw drivers to understand potential queries from tourists with an enhanced knowledge of tourist hotspots. Given the presence of several inland waterways comprising of canal systems and river systems, a development drive could be initiated to enhance the navigability of these bodies of water as an alternative to road travel. A travel experience around water-based travel similar to the Kerala Back Waters in India could be conceptualised and implemented. This will open up an entirely new industry and also provide the tourists with an additional ‘local’ experience. Further, the tourist travel headaches associated with congested roads in Sri Lanka could be mitigated or effectively eliminated. Development of marinas at selected fisheries harbours could also strategically promote sea-based experiences such as whale and dolphin watching. Deep sea fishing, an activity that is extensively promoted in Maldives and wreck diving, given the several sunken ships off the coast of Sri Lanka could also serve as additional tourist attractions. International tourist arrivals reached 1,323 million in 2017. 2017 saw growth in international arrivals of 84 million, or 7%, over 2016. Tourism has grown above average, at around 4% per year, for eight straight years. 393 million more people travelled internationally for tourism between 2008 and 2017.
International tourist arrivals to Asia and the Pacific grew by 5.9% in 2017 compared with 7.7% in 2016. Asia and the Pacific accounts for 30% of the world’s international tourism receipts. A share that has doubled since 2000 (from the initial 17%). Between 2005 and 2016 Asia outperformed all world regions in terms of growth, with international tourists arrivals increasing an average 7% per year compared with the world average of 4%. 2016 was the region’s seventh straight year of demonstrating consistent robust growth. International tourist arrivals (overnight visitors) grew 5% in the first nine months of 2018 over the same period last year, reflecting a continued strong economic situation globally. Asia and the Pacific led growth from January-September 2018, with arrivals increasing 7%. Europe and the Middle East also recorded sound results with 6% growth, while Africa saw a 5% increase. The Americas grew more modestly at 3% during this nine-month period.